This is going to be a non nail polish post, but I loved this so much I wanted to share. On Tuesday, I won Gina from Prim and Polished giveaway. It was a $25 gift certificate for Crosscreek Country Candles. I have always been a candle/scent person. I've never bought candles online, and I only have a few because to be honest candles can get expensive! I don't know why it never occurred to me to look up tarts (which is scented wax sans the wicks), but I'm glad I discovered these now through Gina & Crosscreek Country Candles because I'm very pleased! Deana is the owner of Crosscreek Country Candles. She's been making these tarts for 9 years. I always appreciate a home grown business. My father has had his own business for almost 22 years, and I understand the love and dedication that goes into creating and maintaining your own thing. Deana's business is no exception. She is very friendly and easy to communicate with. I ordered on Wednesday, and got my tarts today! She packaged everything nicely, and it overall was a wonderful experience. I will 100% be getting her stuff again and again. I will not need a gift certificate in the future these are totally worth the money. That being said, these are very affordable! The last two were smaller tarts Deana sent me as extras. The larger tarts were $2. She also has smaller tarts and specialty tarts in shapes like baked goods, hearts, bunnies & etc. She has tons and tons of scents you can choose from. I won't go into detail on the scents I got, because I know everyone has their specific taste. I prefer fresh/clean, spicy, or tropical scents. All of these I got were great, but I'd have to say the standouts are Bamboo Sugar Cane, Coconut Lemongrass, Cactus & Sea Salt, Mediterranean Garden Spa, Cucumber Aloe, and Salty Sea Air. I am sensitive to smells, and none of these I found to be off putting or too intense. Thank you so much Gina for having this giveaway, and thank you Deana for introducing me to your excellent product! 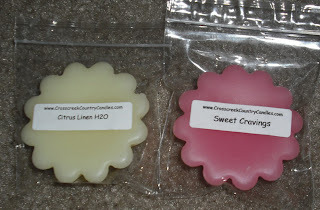 If you're interested, be sure to check out Crosscreek Country Candles! They're also on Facebook. ive never used these before but have seen them ALL over the candle outlets in pennsylvania! i saw a super cute one at big lots too which had ice cream scoop shapes ones that stood on an ice cream cone shaped burner-y thing! impressed at your brave decision to buy scents online! and im happy you like them so much! congrats! Yay! I am so happy you love them. Isn't Deana great!? Her products rock!! !I LOVE Bamboo Sugar Cane it's one of my top scents from Deana it's so crisp!!!!! I love tarts! Lolcandles is my go-to tart co, tho ive tried others. Question-what does Storm Watch smell like? Would you reccomend it? I think im going to do a small cross creek order to check them out.